As another component of the Future of Work thinking I’ve been doing, one thing that strikes me is the question of what helps people want to work, which I think pretty clearly will be important. And I was reminded by my ITA colleague Jane Hart of the work of Dan Pink in his book Drive, where he isolates three components of what makes people engaged: autonomy, mastery, and purpose. And I think this is a good list. The idea is fairly straightforward: people want work that actually does something important, they want to be free to pursue that work, and they want to be developed in their ability to accomplish that work. What work is appropriate for different people is part of the task of deciding who to hire, and who to assign to what. And while I think autonomy and mastery are part of the picture, for sure, I want to focus on making work meaningful. OK, freeing up people from micromanaging is going to be a necessity going forward, but that’s part of the necessary move to agile organizations, and while that’s challenging, it has to happen for organizations to survive. And supporting people by giving them assignments that stretch their abilities, and coaching them through it is absolutely important, but flows out of the 70:20:10 model. Jane, in her valuable book Modern Workplace Learning, gives very specific guidance about managers developing individual potential as part of the larger picture. But the area that strikes me as something I haven’t developed my thoughts about before is finding ways to characterize work so that it connects to people. I think work has to be meaningful (just as I argue learning has to be meaningful). Here I mean something specific, in that people see the connection between what they’re doing and the impact on the world. And that’s not always done, and certainly not systematically or well. And yet I think it’s a service to the employees and part of a thriving organization. Heck, it probably even leads to better employee engagement ;). Seriously, it first takes an organization that has a clear focus on what it’s doing. There’re the old stories about ice companies losing out when refrigerators came in, and I think that’s part of it: a very clear focus on what purpose they serve. And this is important to align an organization, and make the strategy easier to focus on. A secondary desirable component, to me, is to understand what contribution the organization is making to the world. I think the ‘b corp‘ notion is a great one here. (I may be an idealist, but that’s the world I want to live in. ;). Then, there needs to be a clear alignment between what the employee is doing and the overall organizational goal. I think that if there’s a clear purpose for the work, you have a greater likelihood for employees to be engaged. No one likes busywork, after all, but even some drudge work that’s part of a bigger picture can be shouldered. And it also means that rote work, work that can be automated, should be automated, leaving people free to do the important work. Very much like learning needs to see how the learning connects to their work and the bigger picture, so too should their work connect to the bigger picture, within and outside the org. Not to say this is easy. It requires clear communication (queue the Coherent Org), and a clear vision, but these are steps organizations need to do. The recognition that this alignment, coupled with a ‘safe’ culture (i.e. not the Miranda Organization), is the necessity for going beyond survival to ‘thrival’ I think is the catalyst for change in meaningful work. And that’s a good place to go. In thinking a bit about the Future of Work, one of the issues is where to start. 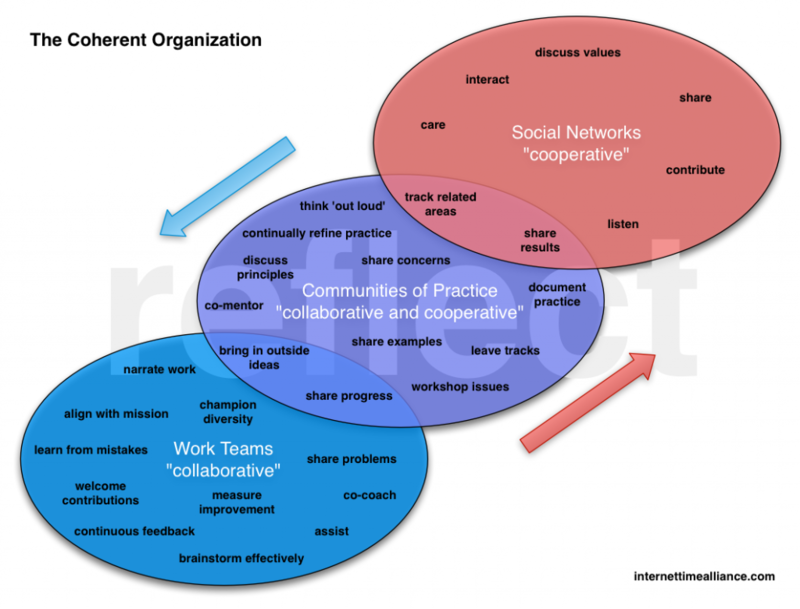 If we take the implications of the Coherent Organization to heart, we realize that the components include the work teams, the communities of practice (increasingly I think of it as a community of improvement), and the broader network. But where to begin? A couple of principles fall into place for me. The first is the notion of ‘trojan mice’, e.g. small steps rather than a epic change. That, coupled with the notion of scaling up from the small, leads me to believe that the best place to start is to start small. This follows on the advice about change in general that changes should be strategic and leveraged. So, a natural place to start small is the team itself. The goal would be to draw upon a diverse team meeting a real need, but facilitating their tool use. I remember an engagement with a Scandinavian oil company that I was brought in on, where they started out establishing teams for new projects that crossed geographies (and, implicitly, cultures), scaffolded them using collaboration and communication tools, and then released them back to other projects. The goal was to skill up teams and have the team members become viral influences. Another approach, as there are already likely communities in existence, would be to migrate and facilitate communities online. I recall that the Defense Acquisition University took this approach. However, I might like to get some project teams going with tools and then migrate out to the communities, where those team members that had participated were familiar with the tools and could be drawn upon by the community. In fact, after the initial team work, I might facilitate a team not only working together, but working out loud back to their respective communities. And while it makes practical sense to be sequential, at some point it might make sense to go parallel, and be having the working out loud from the teams being worked on at the same time as the community development. But for resource reasons, I might make it sequential. Ultimately, you want to be facilitating the communities participating in and outside the organizations, and looking to other communities both inside and outside for inspiration. The point is to be finding a small way to begin, and maybe take several tries until you work out how to do it well, then start scaling up and out. You want to build need, awareness, and ability steadily. It can effect a change in culture too, if the principles that make this work in teams and communities begins to be made aware as well. And this is not independent of work on going to more performance consulting and performance support in the organization, but instead is a complement. In previous exercises, different organizations have prioritized different elements, where you begin will be dependent on your context. So, in the social space, this is my instinct and experience, but welcome hearing alternate viewpoints. As part of my thinking about the Future of Work, I’ve been thinking about how to make it safe to share, in the sense of an innovation culture (ala the Learning Organization). My ITA colleague, Charles Jennings, shared a very useful format to facilitate this, and I wanted to think out loud about it in terms of actionable items. 2.How would you respond differently to achieve better outcomes in the future? 3.What learning can you take away from these experiences? The first one is designed to open discussion. Of course, it has to be ‘safe’ to share these challenges and successes, but making a habit of asking about them and of course an individual’s assignments or projects should be known and shared. It’s the followup questions that can help establish the safety to share. Thus, the second question, doesn’t focus on mistakes, it focuses on alternatives. I might even be inclined to ask, instead: “what other ways could you have responded and what ways might you try to achieve better outcomes in the future”, exploring the space of possibilities a bit (to avoid being trapped in local maxima). The point here is to consider a broad swath of possible approaches and focus on improvement. Finally, the third questions focuses in on lessons. What did an experience teach you, and how might you act differently on the basis of this. The point is to look for the lesson. I’d add that as part of learning out loud, sharing the lesson learned can be shared. Charles noted to me that evidence suggests that 70% of manager/managed meetings is taken by the manager speaking. That’s not necessarily a good ratio; it would likely be better 50/50 or even less! You don’t want to celebrate mistakes, but you do want to make it safe to share. In fact, a lovely story I heard once was from a small company that rang a bell in the middle of the office, not when the mistake was made, but when the lesson was learned. That way everyone else could learn not to make the same mistake! It celebrated learning, and validated experimentation. So while a good culture is the result of actions, scaffolding good actions through structure can help drive the culture forward. Do you have tools you use to help make things productive? The point is to make your work visible. There’re two points: showing the actual goals, progress and status of your work, and showing the thinking that’s going on behind it. And there are two dimensions: within the organization, and outside the organization. Pragmatically, this yields some concrete and actionable elements. First, there have to be mechanisms to share. Ideally, you don’t have to work and then separately post it, but instead your tools automatically share. This really means collaborative work tools, because you want people to be able to engage: at least commenting, and of course sometimes (maybe most of the time) you’ll be working in a team. Also tools that track contributions and changes. And there may have to be permissions: so some people can edit, some can only comment, etc. And I wouldn’t assume folks know what it means to ‘narrate your work‘ (aka learn out loud). Here, I mean exposing the underlying elements. This includes the context, assumptions, considerations, experiments, and reflections. In User Interface Design, it was called Design Rationale, and it’s showing not only the current state, but how you got there. Benefits include others’ experiences, not revising early decisions when new team members are added, and more. The typical techniques of being explicit, modeling, evangelizing, promoting, etc, play a role here. Then of course it has to be ‘safe’ to share, you can’t be working in a Miranda organization. If your work will be held against you in any way, you won’t want to share. This means culture and policies and more. Basically, you need to be working in a Learning Organization, where the elements are aligned to facilitate optimal engagement. This includes the practices about how to work out loud and learn out loud. Another issue is how far to share. What can you share outside the organization? Harold talks about the essential requirement of sharing outside the workplace, and that can be a big concern. Obviously, proprietary work needs to be protected until it’s not business vulnerable. This means policies about what’s safe to share, and when. Certainly, ‘sanitized’ work, where critical details are obscured but the thinking is shown should be supported in going out to communities of practice. And the end result, when the business advantage isn’t threatened, could and should be shared through articles or webinars or conference presentations. At the end, it’s a risk/reward tradeoff for any project at any time. What’s the benefit of getting feedback to improve versus what’s the downside of information getting out to competitors or exposing regulated data? At any point, with any particular version of ‘anonymizing’, the balance may tip one way or another. But the point is to be open to the benefit, and take advantage of it when and where you can. Getting systematic at making it a regular part of any project is likely to be key. It’s what I do here, and I encourage you to work out loud as much as you can. So, any feedback so far? One of the things to do with models is use them as the basis to explain and predict. And right now I’m working with the Coherent Organization model (which emerged from the work of the ITA) and looking at the implications for decisions. How does this model map to choices you make in the organization? There are three layers: work teams composed of members from different communities of practice, that are connected outward to broader social networks. An important element is the flow of information within the model; ensuring that there are no barriers to making effective choices. At the work team level, you want people to be able to communicate with one another effectively, and collaborate to find answers. While this can occur face to face, you don’t want geography or chronology to be a barrier. So you want good tools that can represent and support shared understandings. You might also want ways for the team members to find out more about each other, via profiles. The members of the teams should be bringing in their understandings from their communities, but also be free to ask questions of their community in case their understandings aren’t sufficient. And of course they should share their learnings back with the community. This latter naturally implies good communication and collaboration tools as well, but here the community is not only within the organization, but outside as well. There certainly will be internal sites for the community with proprietary information and tools, but there also needs to be participation in the broader discussion. Just as you (should) go to conferences to share with colleagues not in your workplace, so too should you be participating in online communities. The learning should be ongoing. This also implies that there needs to be an effective way to go beyond the intranet. You get security concerns here, but you need to find a balance, or you’re cutting off half of the organizational brain! Team members should be asking questions of the internal and external communities (as appropriate, and policies about what’s allowed to be discussed, even if it’s just “don’t be an idiot”are fair enough), and answering them in turn. And, of course, the community should be observing related communities of practice inside and out, and sharing their own learnings. For example for learning design there’s a need to track developments in fields like software engineering (e.g. ‘agile methods’), design in general and specific design like game, graphic, interface, etc, sociology, anthropology, psychology, neuroscience, and more. Decisions, then, are about how to facilitate the most optimal flow of information without compromising organizational integrity. Realize, of course, that except in extreme cases, these folks will have mobile devices, so in some sense you can’t really block their queries, but you really don’t want to anyway. Yes, you lock up the data you have to protect, by law or responsibility, but other than that you try to support communication that can advance the organization. It’s about policies and technologies (and of course culture, but that’s another story). As always, so what am I forgetting? It turns out that I’ve been to a lot of conferences this year (8, if my math is right) scattered through the year and around the globe. And over the past decade, I’ve hit a lot more. And it’s given me some opportunities to contrast and compare some of the tradeoffs that can be made. So I thought I’d share my thoughts with you. Now, my perspective starts out a bit different. At these events, I’m speaker, so I see things from a different perspective. However, I also try to go see sessions as an audience member as well, and I still see the same events. So I am trying to write this from all perspectives: conference organizer, attendee, speaker, and vendor. And let me be clear, I’m a learning technology strategist, and my passions are learning, technology, and how to use them together to make things better. So that colors my comments. Keynotes: I am tired of ‘inspirational’ keynotes. I really don’t need to hear some person who climbed a mountain or sailed a sea and their attempts to connect that to learning somehow. I’d rather hear about an issue that affects learning. Topics about how we think, work, or learn are of interest. Let’s hear about the risks of technology, or some new ones or ways to use them. Yes, I like compelling speakers, but please give me new thoughts, not random aspiration. Speakers: I think it’s unconscionable to have an unprepared speaker who can’t manage time. It’s even worse on panels or shared sessions where one speaker runs over. It’s just not fair to the other speakers. It’s also essential that the talk is not a sales pitch, but instead presents real value in ideas or experience. And they should be happy to chat afterward. It boggles my little mind when someone gets up and clearly hasn’t practiced and checked their timing. It’s appears I’m somewhat unusual, but I really don’t necessarily feel the critical need to spend most of the time conversing with others. I don’t mind, and even can recommend some interaction, but I want to hear something substantive as well. Schedule: I like events that have a clear and comprehensible schedule. I want to know exactly what things are at the same time, so I can choose and then vote with my feet if the first choice isn’t working for me. Having different tracks have different schedules doesn’t work. And as a speaker and an attendee, I don’t like short sessions. Give me at least an hour as a speaker to set the tone, present the topic, talk about the issues and tradeoffs, and talk about the way forward. Similarly as an audience member, I want suitable depth. 30 minutes just isn’t enough. Breaks: And then I want a break. The break should be long enough to potentially chat with the speaker at the preceding event, get out and find some sustenance, use the facilities, have a conversation or two, and get to the next event. Workshop breaks can be shorter, as you’re with a group for a half or full day, but for separating concurrent sessions, they need to be sufficiently long. Events: I love having social events, as a way to have those important serendipitous conversations. An evening reception after the first day is mandatory. I like sufficient nibbles to fend off the need to escape to dinner, or dinner actually provided. And for the end of the day, I like social lubricant. Preferably on demand, not via a limited ration. It doesn’t have to be a broad selection, but not having to worry about logistics means my mind is free to focus on conversations. I assume lunch is provided, of course, and it doesn’t have to be fancy or rich, just healthy, substantive, and reasonably tasty. Other events, such as mid afternoon treat breaks, and mid morning snack breaks are great. I really like it if some form of breakfast is available as well. I think I’m not the only one who prefers to eat little bits over time, not big meals. Expo Hall: I like to have an exhibition. I like to see what’s around. Yes, I don’t like walking past and being grabbed, but I do like it if I can go up, have an intelligent conversation about the problem solution, and not feel pressured. I like to see the alternatives, and take the temperature of the market. And I like people who might have real needs to be able to explore real solutions. Having events in the expo area makes sense to me and the vendors. App: I used to get a PDF of the program and put it on my tablet. Now I am happy using an app, and it’s become a must-have. I like it when I can choose sessions for my schedule and have reminders. I like having a stream of information, though it could be via Twitter. I like having an expo map if the expo is of any size at all. And I don’t really care for gamification to reward participation. While I like the engagement of users, it leads to too many frivolous posts. I really like it if presentation material is available through the app, and happy to do evaluations that way. Bookstore: I think a bookstore is important, for several reasons. For one, you can get a heads up on a speaker before you see them. Or if you miss a session, you can graze what you might have missed. You might also want to get the works of someone who you really were intrigued by. It’s also a way to see what’s happening in the field. Rest areas: I don’t really need speaker prep. Sometimes it may be handy if the event is really big, but the main things is, instead, having good connection to event staff. And I think that’s true for all, not just speakers. Having places to sit for all attendees means that anyone needing a break whether social or physical can achieve that end. People: The staff makes quite a big difference when they’re knowledgeable and helpful. This has almost always been the case, but it’s nice to have informed people ready and willing to help. This is true for vendors as well, having friendly and knowledgeable people trumps having shills who can chat you up but can’t really answer questions. So, what have I forgotten to address? I realize that there are different audiences, purposes, and business models for these events, and so not all things are comparable. And this is also my opinion, and your motives may differ, but I hope I’ve laid out some of the thinking to help you think about what works for you. And I hope to see you at a conference sometime! I recently came across an article ostensibly about branching scenarios, but somehow the discussion largely missed the point. Ok, so I can be a stickler for conceptual clarity, but I think it’s important to distinguish between different types of scenarios and their relative strengths and weaknesses. So in my book Engaging Learning, I was looking to talk about how to make engaging learning experiences. I was pushing games (and still do) and how to design them, but I also wanted to acknowledge the various approximations thereto. So in it, I characterized the differences between what I called mini-scenarios, linear scenarios, and contingent scenarios (this latter is what’s traditionally called branching scenarios). These are all approximations to full games, with various tradeoffs. At core, let me be clear, is the need to put learners in situations where they need to make decisions. The goal is to have those decisions closely mimic the decisions they need to make after the learning experience. There’s a context (aka the story setting), and then a specific situation triggers the need to make a decision. And we can deliver this in a number of ways. The ideal is a simulation-driven (aka model-driven or engine-driven) experience. There’s a model of the world underneath that calculates the outcomes of your action and determines whether you’ve yet achieved success (or failure), or generates a new opportunity to act. We can (and should) tune this into a serious game. This gives us deep experience, but the model-building is challenging and there are short cuts. In mini-scenarios, you put the learner in a setting with a situation that precipitates a decision. Just one, and then there’s feedback. You could use video, a graphic novel format, or just prose, but the game problem is a setting and a situation, leading to choices. Similarly, you could have them respond by selecting option A B or C, or pointing to the right answer, or whatever. It stops there. Which is the weakness, because in the real world the consequences are typically more complex than this, and it’s nice off the learning experience reflects that reality. Still, it’s better than knowledge test. Really, these are just a better written multiple choice question, but that’s at least a start! Linear scenarios are a bit more complex. 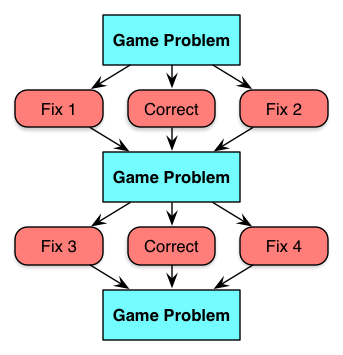 There are a series of game problems in the same context, but whatever the player chooses, the right decision is ultimately made, leading to the next problem. You use some sort of sleight of hand, such as “a supervisor catches the mistake and rectifies it, informing you…” to make it all ok. Or, you can terminate out and have to restart if you make the wrong decision at any point. These are a step up in terms of showing the more complex consequences, but are a bit unrealistic. There’s some learning power here, but not as much as is possible. I have used them as sort of multiple mini-scenarios with content in between, and the same story is used for the next choice, which at least made a nice flow. Cathy Moore suggests these are valuable for novices, and I think it’s also useful if everyone needs to receive the same ‘test’ in some accreditation environment to be fair and balanced (though in a competency-based world they’d be better off with the full game). Then there’s the full branching scenario (which I called contingent scenarios in the book, because the consequences and even new decisions are contingent on your choices). That is, you see different opportunities depending on your choice. If you make one decision, the subsequent ones are different. If you don’t shut down the network right away, for instance, the consequences are different (perhaps a breach) than if you do (you get the VP mad). This, of course, is much more like the real world. 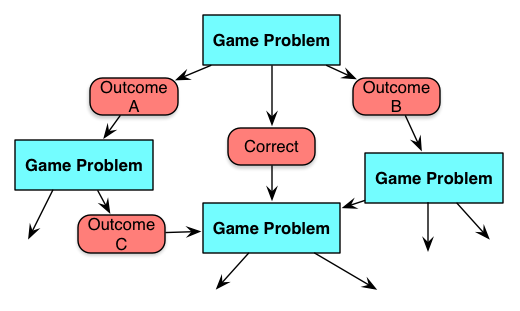 The only difference between this and a serious game is that the contingencies in the world are hard-wired in the branches, not captured in a separate model (rules and variables). This is easier, but it gets tough to track if you have too many branches. And the lack of an engine limits the replay and ability to have randomness. Of course, you can make several of these. So the problem I had with the article that triggered this post is that their generic model looked like a mini-scenario, and nowhere did they show the full concept of a real branching scenario. Further, their example was really a linear scenario, not a branching scenario. And I realize this may seem like an ‘angels dancing on the head of a pin’, but I think it’s important to make distinctions when they affect the learning outcome, so you can more clearly make a choice that reflects the goal you are trying to achieve. To their credit, that they were pushing for contextualized decision making at all is a major win, so I don’t want to quibble too much. Moving our learning practice/assessment/activity to more contextualized performance is a good thing. Still, I hope this elaboration is useful to get more nuanced solutions. Learning design really can’t be treated as a paint-by-numbers exercise, you really should know what you’re doing! At the recent Online Educa Berlin, Laura Overton of Towards Maturity presented some stats in our joint session. While she mentioned that she really had to look for results where there were differences by age, she of course found some. (Which already is a problem; 5% of results are likely to be significant by random chance!). However, in at least one case I think the results is explained by another factor than generations (not that she was making the claim). In those statistics was an interesting result that I want to look at from two different perspectives. So, this result, one of the most striking, was that 64% of those 21-30 were motivated to learn to obtain certification, while only 22% of those over 50 were so motivated. That really seems like to might fit the generational differences story, where over 50s, the baby boomers, differ from the millennials. Here, the millennials are worried that the world is not a safe place, and want accreditation to help preserve their access (my rough story based upon millennial descriptions). And the baby boomers are more positive and trusting, so consequently feel less drive for certification. Or create your own explanation for the divergence based upon the differences between the generations. Ok, what struck me is that there’s a totally different explanation: those in the 21-30 range are young and new. They want certifications to support their advancements, as they don’t have a lot of experience. Those who are older have real experience to point to, and have less need for external validation of their learning. Here what we’re seeing is that this is not related to generations, but by age. And that’s very different explanation for the same phenomena. The core point is that if the generational explanation would be true, this would stay true as these generations aged. The millennials, at age 50, would still care more about certifications. If it’s more a ‘stage of life’ thing, as they aged they’d care less, but those folks who were growing into that younger range would also demonstrate the differences. The problem is that there are confounding explanations for the same data. So what else do we look at? Interestingly, in my research about what the data says, I’ve found several studies that show that when you ask folks what they value in the workplace, there is no significant difference by generation. That is, generations as defined by societal circumstances at the time of growing up doesn’t have an impact on workplaces. Now, there have been a few exceptions, including the above (and I’ll reiterate, Laura wasn’t make a generational claim for this), but the question then becomes whether there are other explanations for the differences, such as age, not context. Could other factors, such as natural age differences, create a perception of generational differences that truly isn’t persistent? Ok, I’ll buy that WWII was a global event and the impacts were clear and measured. But other than that, sure there were landmark popular culture elements and zeitgeists, but I think most of the other defining characteristics are nowhere near as clearly delineated in impact (I’ve heard claims of divorce, latchkey kids, etc being generational factors), and I doubt that they’re sufficiently delineated to create the defining characteristics that are proposed. My take home? Be suspicious of someone pushing a particular viewpoint without scrutiny of alternate hypotheses (including mine). There may be a better explanation than the one someone has a vested interest in pushing. Is there a real millennial difference? Certainly the so-called ‘digital native’ myth has been debunked (e.g. no better at search queries or evaluating results of same than any others), so maybe we want to be wary of other claims. I’m willing to be wrong on this, but my research says that the data seems to point to other explanations than defining generations. What say you? As I’ve reported before, I started mind mapping keynotes not as a function of filling the blog, but for listening better. That is, without the extra processing requirement of processing the talk into a structure, my mind was (too) free to go wandering. I only posted it because I thought I should do something with it! And I’ve realized there’s another way I leverage cognitive overhead. As background, I diagram. It’s one of the methods I use to reflect. A famous cognitive science article talked about how diagrams are representations that map conceptual relationships to spatial ones, to use the power of our visual system to facilitate comprehension. And that’s what I do, take something I’m trying to understand, some new thoughts I have, and get concrete about them. If I can map them out, I feel like I’ve got my mind around them. I use them to communicate, too. You’ve seen them here in my blog (or will if you browse around a bit), and in my presentations. Naturally, they’re a large part of my workshops too, and even reports and papers. As I believe models composed of concepts are powerful tools for understanding the world, I naturally want to convey them to support people in applying them themselves. Now, what I realized (as I was diagramming) is that the way I diagram actually leverages cognitive overhead in a productive way. I use a diagramming tool (Omnigraffle if you must know, expensive but works well for me) to create them, and there’s some overhead in getting the diagram components sized, and located, and connected, and colored, and… And in so doing, I’m allowing time for my thoughts to coalesce. It doesn’t work with paper, because it’s hard to edit, and what comes out isn’t usually right at first. I move things around, break them up, rethink the elements. I can use a whiteboard, but usually to communicate a diagram already conceived. Sometimes I can capture new thinking, but it’s easy to edit a whiteboard. Flip charts are consequently more problematic. So I was unconsciously leveraging the affordances of the tool to help allow my thinking to ferment/percolate/incubate (pick your metaphor). Another similar approach is to seed a question you want to answer or a thought you want to ponder before some activity like driving, showering, jogging, or the like. Our unconscious brain works powerfully in the background, given the right fodder. So hopefully this gives you some mental fodder too.